Montblanc has launched Emblem Absolu, a new fragrance for men. Emblem Absolu is a flanker to 2014's Emblem and Emblem Intense. Montblanc Emblem Absolu. Created for a man who is decidedly audacious, confident and influential, the new striking gold bottle is emblematic of a man who is the embodiment of success. Emblem Absolu follows in the footsteps of its two predecessors, adding its own brilliantly opulent and luxurious signature qualities. The fruity-woody-oriental perfume gains an irreplaceable note of cardamom at the heart of its fragrance trail, bringing energetic spiciness to refresh the fruity cocktail of juicy pear and tingling mandarin- a luscious combination that makes his skin good enough to eat. A shot of pink pepper and a philtre of lavender essence and honeyed fruits. These warming notes weave a cloak of mystery around the invigorating sensuality of Emblem Absolu as another ingredient common to the three scents, patchouli, drifts up from its depths, intertwined with crystal moss and powerful vetiver. 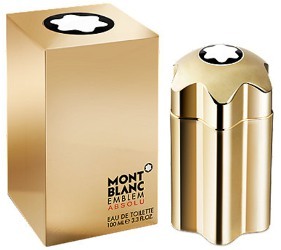 Montblanc Emblem Absolu is available now at Debenhams in the UK, in 100 ml Eau de Toilette. Hmmm, cardamom, pear and patchouli, nice combination. Purty bottle too. You’ll have to report back if you come across it. I like the Mont Blanc bottles, too, and a lot of their notes lists sound good, but I don’t think I’ve ever seen them anywhere, or seen samples for sale, either. I have never seen them either other than the Legend series (Bloomies has those).